The One Where Donald Glover Forgets Black Women. Again. Childish Gambino, also known as Donald Glover, recently released a video for his new single “This is America.” The song revealed many hideous truths about America and the part black people often play in it. 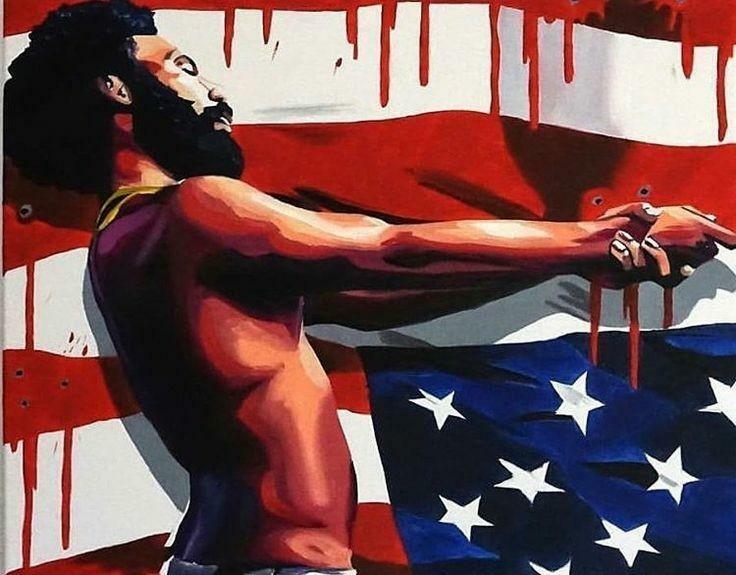 It featured a variety of symbolism and themes such as (but not limited to): gun control, minstrel shows, police brutality, protests, capitalism, marijuana, and the death and birth of a corrupt nation. But even with the dizzying array of issues Glover managed to include, I was still left longing for something: myself. Watching all of this, you'd think Black femmes were completely absent from even the correctives to history. On Black Twitter, there were many fans who disagree with not only Gambino's direction, but the exposure and praise he received from it. Black femmes have especially been giving Glover's work some mixed reviews; the community hasn't forgotten the ugly misogyny in his past where he ridiculed the women of his own race. We are tired of being misrepresented and underappreciated in media, even in media meant for black audiences. Some of Glover’s other projects also exclude softer images of women and femmes. His hit Golden Globe-winning TV show “Atlanta” also features a lack of female writers and directors. With 21 episodes aired, only three of were written by a woman, and they were all by the same writer, Stefani Robinson. Only two episodes were directed by women. In the season 2 episode “Helen,” the writers touched upon the box Van (Zazie Beetz) is placed in by Gambino’s character Earn. Van talks about how people only see her as Earn's girlfriend or their child’s mother. After she makes this statement, there is no follow up to this observation. Instead, we see her character lose in so many ways. Later in the series, we follow her and her group of Black femme friends to a party in the episode “Champagne Papi.” The Black women in this episode are on a quest to meet Drake at his mansion party, and they are represented with no other goal in mind. This image of wanting Instagram fame and wealth amongst Black femmes is a common theme Donald resorts to time and time again. He gives no depth to female characters and only places them in self-centered situations. Where are the images of Black femmes who have aspirations like their black male counterparts on the show? Women writers and directors in this series are mostly only assigned to female-leading episodes. Does Donald do this to help or hinder the female characters by putting only feminine perspectives into their storyline? Why can’t any of the women writers or directors share their insight on the male characters? Donald Glover has addressed these concerns in the past, most famously in 2013 in a note he posted on Instagram. Even though this was written near the start of his solo music career, he still brought his insecurities to the surface. The floating assumptions about his misogyny and inner hatred for his own race has always surrounded him. “This is America” has only brought back unaddressed issues. Some have not forgotten Gambino still shows what internalized racism and misogyny can do to a person when it is avoided. Why did Gambino choose these specific lyrics to not only dance to but for SZA to watch him? Is it a symbol of Black Womyn's struggles in being forced to wait on the sidelines of a male-dominated movement? Are we waiting for Black men to stop enriching themselves by giving (white) America what they want? SZA is not only the one observing Glover as he entertains and proceeds to “get his money;” there is also a quick glimpse of an outside spectator recording this interaction on a notepad before the screen turns dark. Is this symbolic of how people keep tabs on black social movements, or does it represent how closely watched black people are monitored in America? Or is it both? I believe giving Donald props doesn’t take away from the success and message of Black feminists such as Beyoncé and Janelle Monae. We need multiple perspectives on the black experience so we can flourish and collaborate. Having intersectional experiences and acknowledging them allows black artists to thrive and expand to a bigger audience. We need to recognize and respect all perspectives and learn from them all. So to Donald Glover, this is an open letter addressing those things you overlooked. Black women are tired of being a stepping stool in your rise to fame. and a little appreciation from your open-minded creativity would be nice. We would love to be included in this conversation. Jaylin Mitchell was born and raised in Milwaukee, Wisconsin. She is currently pursuing an undergrad degree for Film and Afrocology at UWM; where they hope to own a production company later in life. They hope to inspire social change through her work and become better skilled at film production.